It is recommended to update the OS of your Keenetic through the web interface, if an Internet connection is available. After the update, your device will have the most current version of the system installed. For detailed KeeneticOS update procedure, please refer to the 'Updating the KeeneticOS from the web interface' instruction. 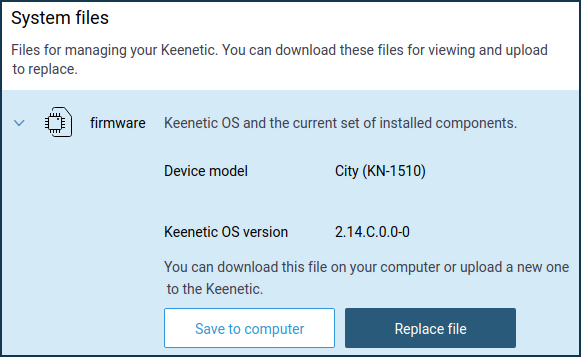 Below is an example of a manual update of the Keenetic operating system via a pre-downloaded system file without connecting Keenetic to the Internet (i.e. offline). All the OS system files for different models of Keenetic routers are located on our website in the 'Download Center' section. Select the model of your device, and then the support page for the selected model will appear. There you will find an archived zip file which contains the system file with the bin extension. NOTE: Important! The 'Download Center' section contains KeeneticOS files with the recommended set of components. It will be possible to change the system components after the system update, if you have an Internet connection. To update the KeeneticOS, go to the 'System settings' page. In the 'System files' section, click on 'firmware'. Then click the 'Replace file' button. In the window appeared, specify the location of the system file for your device (file with the extension 'bin'). You must first extract the system file from the zip archive. The system file will be uploaded to the Keenetic router. NOTE: Important! Do not turn off the power during the update process! When the update process is complete, your Keenetic will restart automatically and then be ready for use again. The web interface will be unavailable for approximately 1-2 minutes. Then, on the 'System dashboard' starting page, make sure that the OS version has changed. It is shown in the 'About the system' information. TIP: Tip: If for some reason you are unable to install the components, please refer to the article 'Frequently Asked Questions on Component Installation and Upgrading KeeneticOS'.